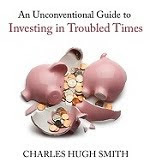 oftwominds-Charles Hugh Smith: The Central Banks Pull Back: Now It's Up to Fiscal Policy to "Save the World"
The Central Banks Pull Back: Now It's Up to Fiscal Policy to "Save the World"
Another problem is the rise of social discord, for reasons that extend beyond the reach of tax reductions and increased infrastructure spending. Have you noticed that the breathless anticipation of the next central bank "save" has diminished? Remember when the financial media was in a tizzy of excitement, speculating on what new central bank expansion would send the global markets higher in paroxysms of risk-on joy? Those days are gone. Nowadays, central banks cautiously continue the bond buying programs they've had in place for years, but their policy initiatives are tepid at best: they talk about expanding asset-buying programs to include more stocks, or discuss notching interest rates higher in some cases; but the talk is subdued, as expectations are being consciously lowered. Even the Davos crowd who benefited so mightily from central bank largesse is looking anxiously over their shoulders, fearing a sharpened pitchfork wielded by an enraged debt-serf might be plunged into their backs. The last big rally was driven not by central bank policy but by a political event--the unexpected election of Donald Trump, who has pushed a fiscal stimulus agenda of reducing regulations and taxes while spending more on repairing and improving infrastructure. My colleague Gordon Long describes this as the Great Rotation from monetary to fiscal stimulus. Monetary stimulus boiled down to a trickle-down wealth effect: if the central banks inflate asset bubbles, those who own the assets bubbling higher will feel wealthier and this will cause them to borrow and spend more, boosting the prospects of the debt-serfs who don't own enough assets to enjoy the central-bank largesse directly. And indeed, the spending of the top 5% soared as the central bank winds filled the sails of those who owned all the assets being pushed higher. But the spending of the wealthy did little for the Main Street economy, which has experienced eight years of stagnating household incomes, a reduction of opportunity and an erosion of purchasing power as supposedly non-existent inflation has nibbled away at their disposable income. Even those of us without PhDs in economics can see that infrastructure spending that goes to wages rather than asset bubbles will have a more positive effect on Main Street than the luxury spending of the wealthy. Unfortunately, there are a few flies in the ointment of fiscal stimulus. One is that a number of cycles suggest the tepid "recovery" is long in tooth and the global economy is overdue for a good old-fashioned recession. A recession--massive writedowns of bad debt and a contraction of private borrowing and spending--tends to offset any gains that might have been notched by fiscal stimulus. Thank you, Cooper K. ($50), for your supremely generous contribution to this site -- I am greatly honored by your support and readership.